Fans of bizarre foreign trash, oddball martial arts movies, low-budget gore-fests and crazy ninja flicks should find plenty to enjoy in this bonkers Indonesian fantasy film featuring loads of frantic fight action, spurting blood and bad special effects. A tasty nymphomaniac crocodile queen abducts men from nearby villages, and keeps them trapped in her sub-aqua palace where she uses them to satisfy her sexual urges. 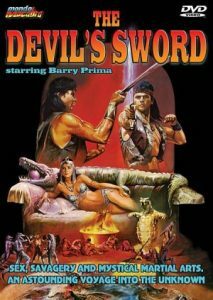 When the evil queen sends one of her top fighters to kidnap a man about to be married, the ever-so-miffed wife-to-be teams up with good warrior Mandala (Barry Prima) to search for a magic sword which can help them defeat their enemies. I enjoy bad films almost as much as I enjoy good ones and, if you feel the same way, then it is highly likely that you will find much to enjoy about this totally weird 80s effort from director Ratno Timoer. With its dreadfully executed, but very bloody, gore effects and non-stop fights, it is hard not to enjoy a movie which scores so high on the silly-ometer. Invite a few friends round, have a few beers and sit back and enjoy watching endless hordes of crocodile men getting sliced by Barry, vicious killers battling each other for possession of the magical sword, a creature that is a serious contender for ‘worst movie monster of all time’, and bargain basement visuals that need to be seen to be believed. The Devil’s Sword might not be a great film, but it is definitely unmissable if you dig strange cinematic offerings from all corners of the globe. I give it 6 out of 10 (although it almost got a 7 for its excessive use of dry ice).